It can be a dangerous game when brands decide to tinker with a classic, and food doesn’t come much more classic than a Birds Eye potato waffle. I don’t know what it is about them, but they’re just seriously good. I don’t care who you are, but waffles, beans and cheese is a scorcher of a meal, any time of day, for anybody. However, do you remember that glorious time in recent history when restaurants across the land started doing sweet potato fries as an alternative to regular chips? It was an eye-opening time, somehow simpler and yet full of hope for the future. So, when Birds Eye announced they were going to tinker with their classic waffles and start selling a sweet potato version, my hope far outweighed my hesitance. The sweet potato waffles will be gluten free and suitable for vegetarians and vegans, so everyone can get on board, and they’re already available in some lucky stores. At the moment, Ocado are selling them for £2.50 for a pack of eight, making them a bit more expensive than your regular waffles, but I reckon it’s about time you treated yourself. The delivery service also has an offer on for five packs for £10, so you might as well fill up your freezer. However, if you can wait, Tesco and ASDA will be stocking the new waffles from November 12. 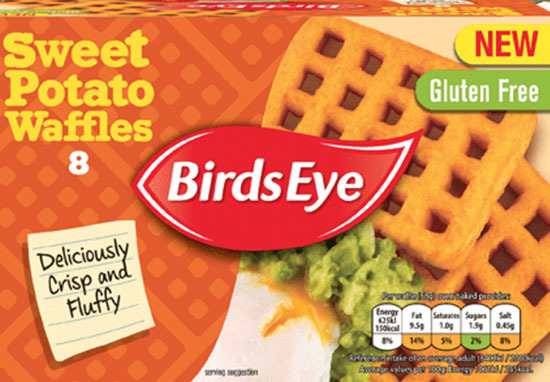 We’ve seen a tremendous rise in the popularity of sweet potato, so we decided to give our classic Birds Eye Potato Waffles a modern makeover. We combine the much-loved shape of our classic potato waffles with a delicious new recipe. We’re confident that they will become a new family favourite. You know, having these on your plate is going to make others jealous. In fact, according to a recent study, Brits suffer from food envy at least once a week, with meals like cheesy garlic bread, pizza, and cheesecake being most likely to bring on the jealously. The research, which was commissioned by Just Eat, found almost half of Brits have suffered from food envy, wishing they were eating what was on someone else’s plate instead. The envy is worse in January apparently, as sticking to healthy New Year’s resolutions only make you crave what others are eating even more. The survey of 2,000 adults also discovered four in 10 will order the same food as other people, simply to avoid feeling jealous, with a quarter totally changing their takeaway choice after seeing what a friend chose. When ordering a takeaway or dining with friends, there’s nothing worse than feeling like you made the wrong choice when the person next to you has something you want more. With many trying to cut back during January, food envy is rife, particularly as we battle to make it to pay day after the long month of having little or no money. Cheesy garlic bread was found to be the biggest evil when it came to inducing food envy, closely followed by nachos, crispy duck pancakes, ribs and onion rings. I reckon sweet potato waffles might be on that list pretty soon!